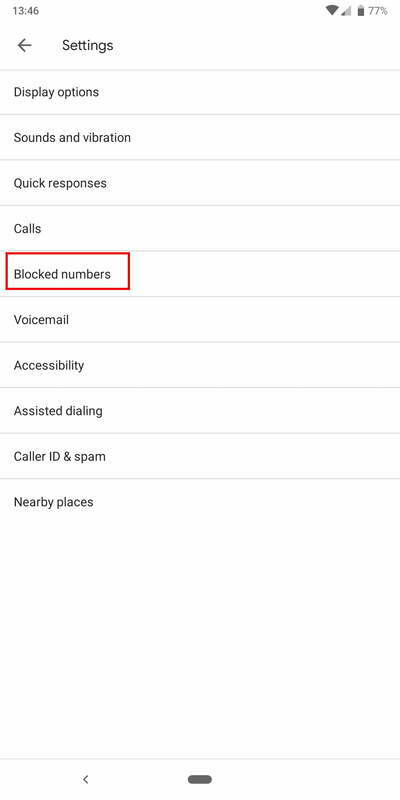 If you’re tired of calls from strangers or telemarketers at the most inopportune times, you may want to learn how to block a number in Android. 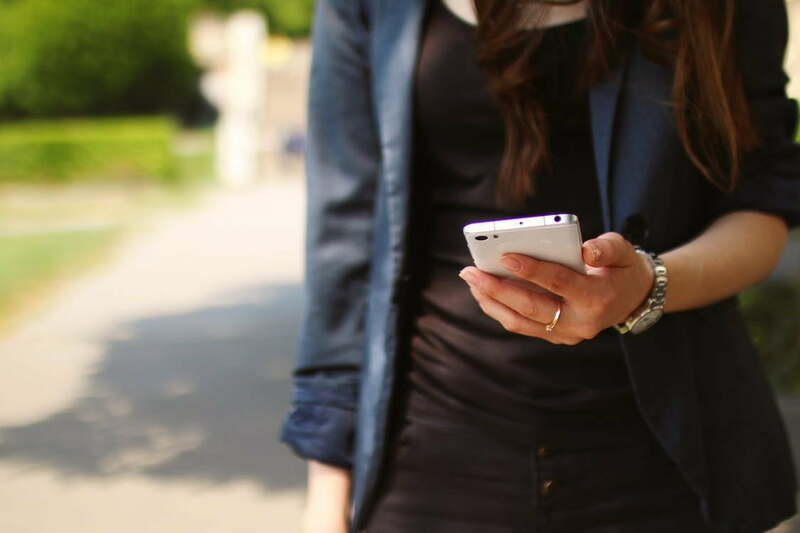 While blocking calls on an iPhone is simple, there are many different ways to block calls on Android smartphones, depending on the manufacturer. While some manufacturers bury blacklist features deep in the settings panel, older devices may not have a native call-blocking feature at all. 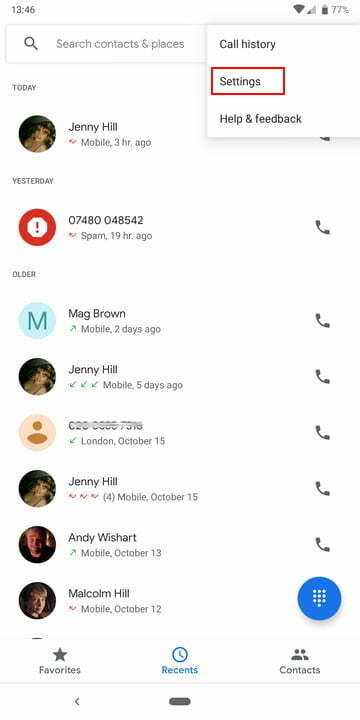 Thankfully, there’s no shortage of ways to block calls on your Android device. Here, we’ll take a look at how to do it with your phone’s native features, and we’ll also suggest a couple of Android apps that are worth considering. If neither of these options work fear not — we’ve also provided information on how to block numbers through your carrier. The methods for doing this will vary slightly based on your specific device and the version of Android that you are using. Many tutorials exist for every Android device imaginable. Take a gander on YouTube or the XDA Developers Forum to find an option for your specific phone. 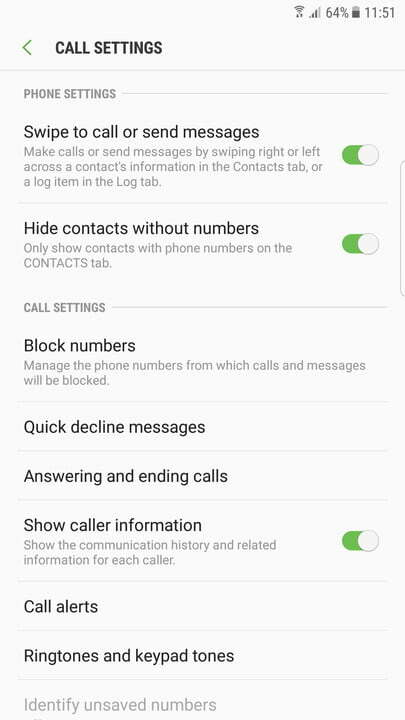 There is no universal path for blocking contacts on Android smartphones, and it’s a feature that older versions of Android oddly omit. Thankfully, for people with phones like the Google Pixel 3 or Google Pixel 3 XL, which run a stock version of Android later than 6.0 Marshmallow, you can easily block a call directly from the Phone app. When in the Google phone app, tap the More options icon (three dots stacked vertically) next to the microphone. Then select Settings > Call Blocking or Blocked numbers and add the number you want to block. You can also go to Call history or Recent calls and tap the number you want to block, then select Block. Here, you can also Report call as spam. 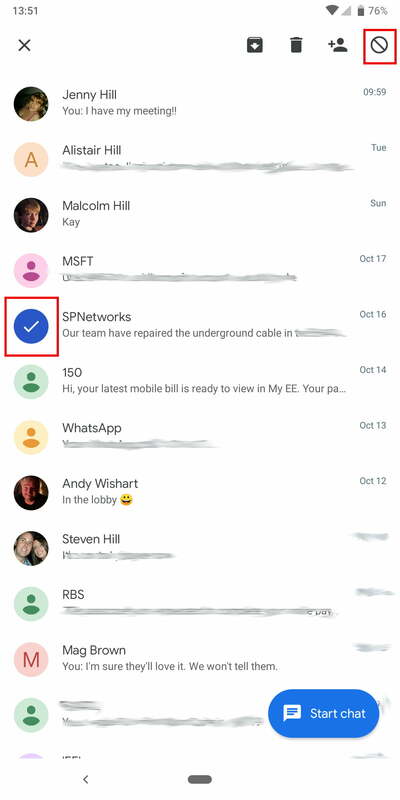 Long press a contact within the Messages app and tap the Block icon (circle with a line through it) in the upper-right corner. You can also tap the More options icon (three dots stacked vertically) next to the magnifying glass, select Settings > Call blocking or Blocked contacts, and add the number you want to block. From the call log, you can disable incoming calls from specific numbers. Select the number you want to block, then hit More or the 3-dot menu icon in the upper-right corner and choose to Add to reject list. 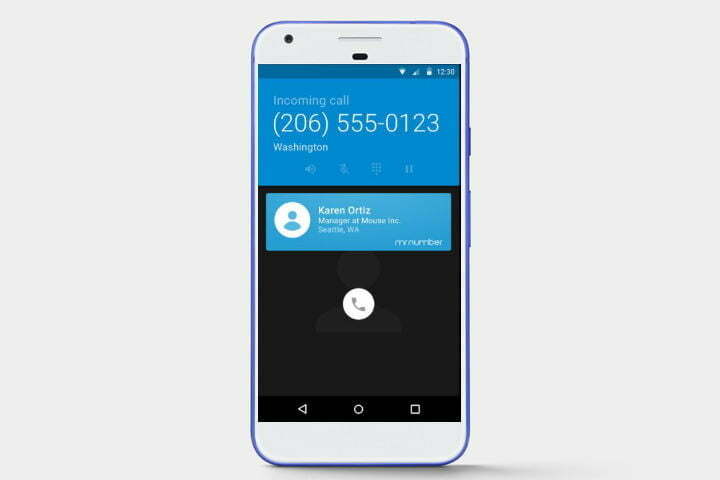 This will disable incoming calls from specific numbers. If there’s a particularly persistent relative, friend, or ex whose number you’ve saved, blocking them’s a cinch. Just pull up your contacts, select the person you’d like to block, and hit the little button in the right-hand corner that looks like a pencil. Then tap the three-dot menu icon in the upper-right corner and check the box next to All Calls to Voicemail. That contact’s calls will now be directed to your carrier’s voice inbox. One of the most common options is to pull up your contact list by selecting the phone icon from your home screen. Then tap the three-dot menu and choose Settings > Call > Call Rejection > Auto Reject List > Create. At this point, Android phones will have a search box that’ll appear. Insert the phone number or name of the person you want to block, and presto, that name will be added to the Auto Reject List. If you have a Samsung Galaxy S9 Plus or another Samsung phone, it’s easy to block unwanted callers. Select the Phone icon on your home screen, tap the three-dot menu in the upper-right corner, and then tap Settings. You’ll find Block numbers listed here — you can also use this menu to manage the numbers on your Block list. If you wish to automatically block unknown callers, simply toggle on the option for Block anonymous calls. You can also block numbers from your call log. To do so, open up Phone > Recents and tap a number or contact. You can then tap Details > Menu (three dots in the upper-right corner) > Block number, which will give you the option to block the number in question. HTC, much like Samsung, has integrated call blocking. To use it, open the Phone app on your home screen and navigate to Call history. 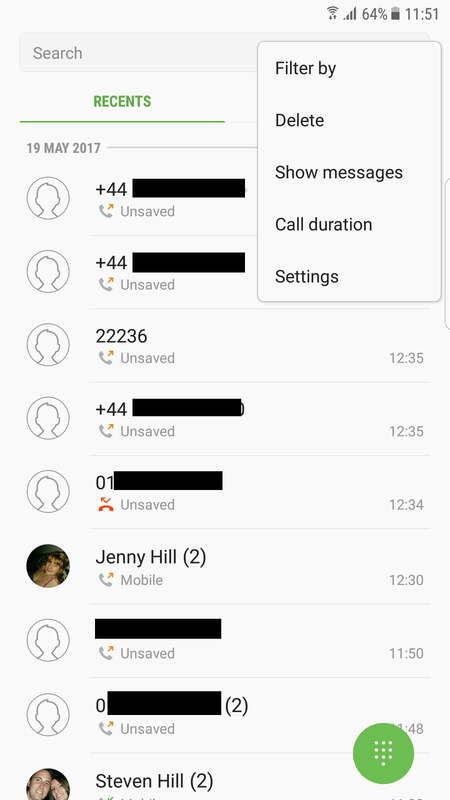 Long press on the number you’d like to block and tap the option to Block Contact or Block caller. 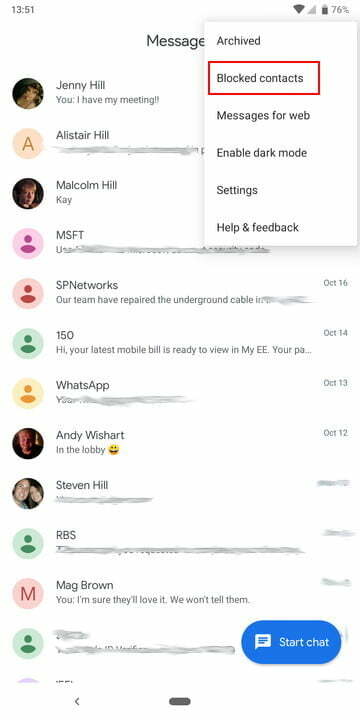 You can review blocked contacts in the Phone app by tapping the menu icon at the top right (three vertical dots). LG has made it relatively simple to block numbers on its handsets, including the LG V40 ThinQ. To start, open the Phone app and navigate to the Call logs tab. Tap the number you want to block and then tap the three-dot menu in the upper-right corner. 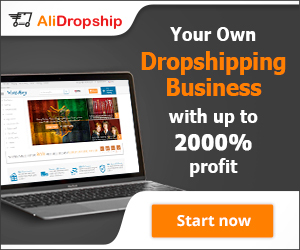 Select Block number from the drop-down menu. You can also review, add, or remove numbers from your list by opening the Phone app, navigating to the Call logs tab, and tapping the three-dot menu in the upper-right corner. Select Call blocking & Decline with the message > Blocked numbers. 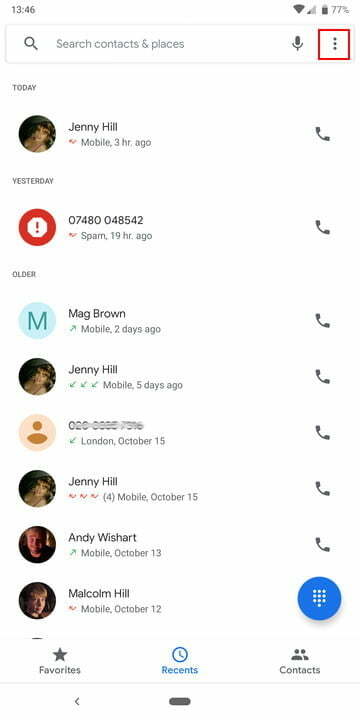 If none of the other options suits you, or you just want a more user-friendly way of blocking calls on your phone, a third-party app may be your best bet. Here are a few solid options. Should I Answer is not your average call blocker. It’s able to block specific numbers or all phone numbers except those in your contact list, sure, but the real hook is its extensive database of known telemarketer, scammer, and premium rate numbers. When you get a phone call, Should I Answer shows a brief description and user reviews of the incoming number, plus the option to leave a rating of your own or add the number to a private block list? Should I Answer also features some of the most robust call-blocking features of any app in its category? 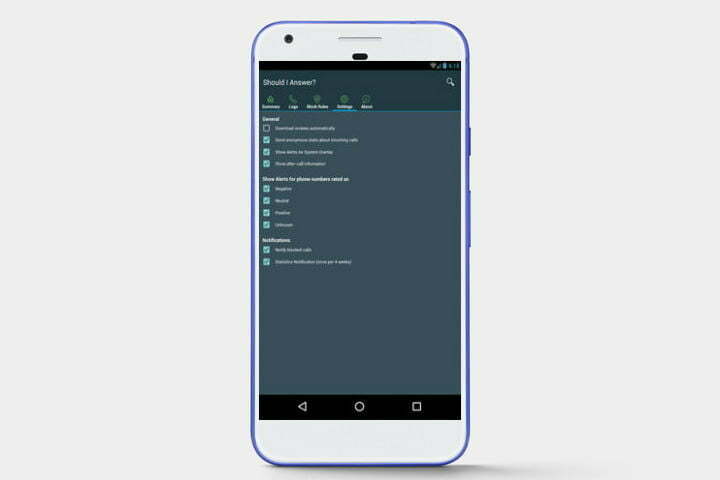 It can automatically filter calls from hidden numbers, premium numbers, foreign countries, and numbers below a certain review threshold. Perhaps best of all, the aforementioned features work offline. The app saves a small copy of the rating database locally. Safest Call Blocker features the usual array of call-blocking toggles — you can block all numbers from a custom blacklist, for example, and block all numbers that aren’t in your contacts — but you can also block a range of numbers using “wild cards.” Can’t stand the incessant 800 number offers for “free” Hawaiian vacations? Add 1-800-###-#### to the block list and you won’t hear one ever again. 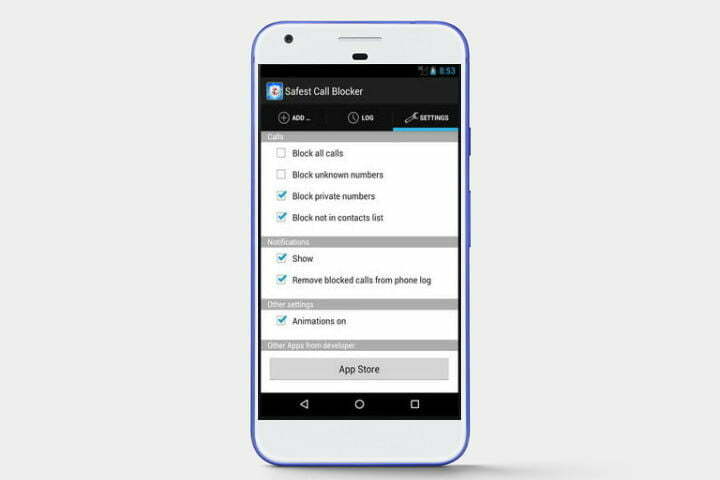 Safest Call Blocker also notifies you when it blocks calls, and automatically keeps blocked numbers out of your call log. This app bills itself as a free alternative text and calling app, with free messaging between members and real-time updates about when your messages have been read. It also happens to be a powerful call- and text-blocking app for Android. 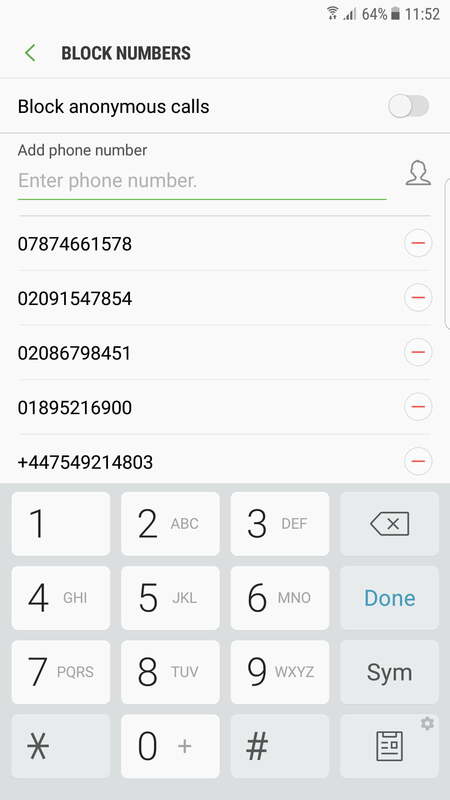 You can block specific numbers or you can block entire area codes. Thanks to user-submitted info on telemarketers and other spam, it’s easy to create a block list that will protect you from cold calls. Here’s another Android call blocker with a big list of user-submitted spam numbers that you can automatically block. This one also ties in with the Federal Communications Commission’s Do Not Call registry. 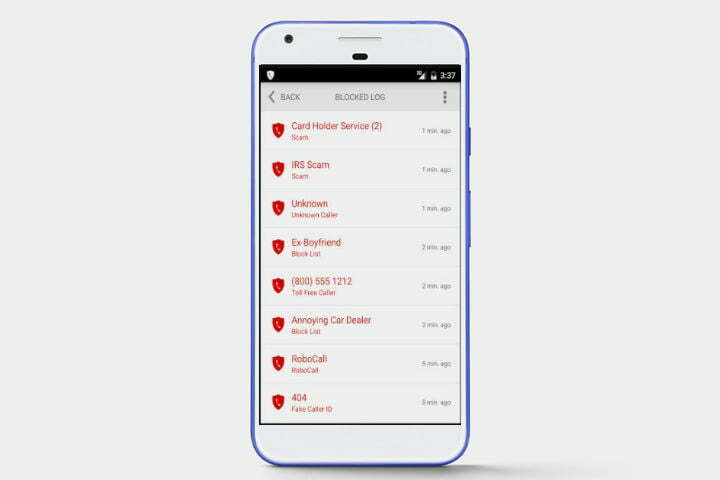 You can decide which calls get blocked and exactly how they are handled with this versatile app. You get a free 14-day trial of the full app before it reverts to a limited “Lite” version unless you cough up $8 dollars. Most major carriers can block calls to your device. Verizon offers this service for free, as does Sprint. There are a few limitations — for instance, Verizon only allows you to block up to five lines and you’ll have to reblock lines every 90 days. If you’re willing to pay $5 per month, you can block up to 20 contacts through Verizon Smart Family. If you want AT&T to block unwanted numbers, you’ll need to cough up $5 a month for Smart Limits. T-Mobile offers number blocking through the Family Allowances service for $5 per month. There are a ton of other Android apps designed specifically for blocking calls, but take time to read reviews carefully and do your homework before opting for an alternative. Many of these apps conflict with antivirus apps, if not one another. 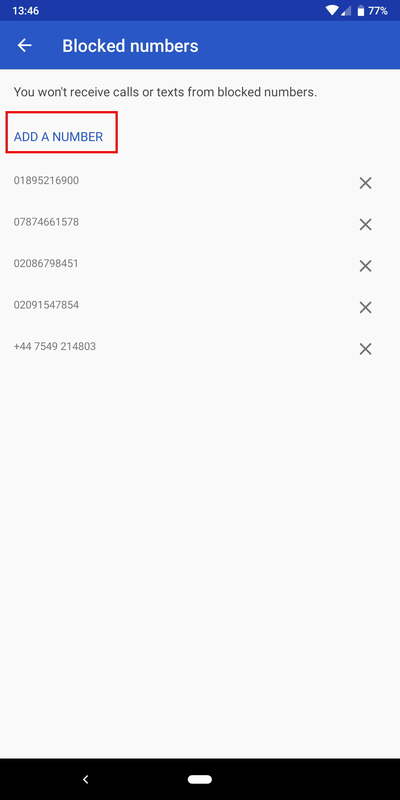 Speaking of Android security apps, if you haveAvast Mobile Security already installed, there’s an option for filtering calls and SMS messages that allows you to block specific contacts.